Thanks to actress Angelina Jolie's public announcement about her breast cancer treatment five years ago, there is broad public awareness about the value of gene testing to identify breast cancer risk associated with mutations in the BRCA genes. Since then, demand for BRCA genetic testing among women has increased. Now researchers are finding growing evidence of strong links between prostate cancer in men and mutations in the BRCA 1, BRCA 2 and other genes. A groundbreaking study published in the New England Journal of Medicine in 2016 found mutations in those DNA-repair genes in 11.8% of men with metastatic prostate cancer, compared with 2.7% of men without a known cancer diagnosis. But there's been no comparable spike in awareness of and demand for BRCA testing for risk of prostate cancer, the third-biggest cancer killer of U.S. men, causing nearly 26,730 deaths last year. That's frustrating to cancer specialists and patient advocates who urge physicians and patients to consider testing. The National Comprehensive Cancer Network just updated its influential guidelines to recommend expanded genetic screening for prostate cancer. It's a diagnosis that will be received by 165,000 American men this year, according to the American Cancer Society. Even if men were clamoring to be tested for prostate cancer risk, some major insurers don't cover the cost. 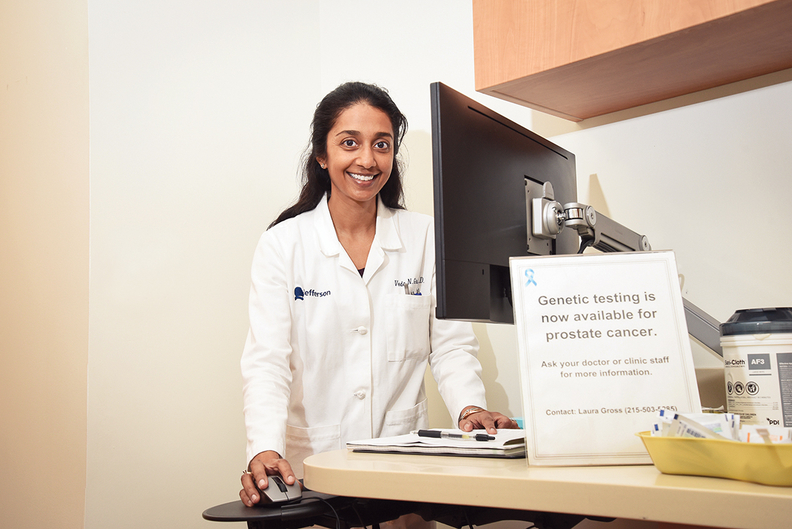 "There is limited awareness of the potential role or benefit of genetic counseling and testing for men with prostate cancer," said Dr. Veda Giri, director of the cancer risk assessment and clinical cancer genetics program at Thomas Jefferson University's Sidney Kimmel Cancer Center in Philadelphia. "Access to counseling and testing definitely needs to grow." William Burhans, a scientist at Roswell Park Comprehensive Cancer Center in Buffalo, N.Y., personally experienced this knowledge gap. From his work, he knew evidence was emerging about ties between prostate cancer and genetic mutations. Soon after he was diagnosed with prostate cancer in 2013, he asked his oncologist to refer him to a genetic counselor. He thought the genetic information could help guide his treatment and inform his family members about their cancer risk. Burhans' oncologist was skeptical but approved the referral in deference to his patient's expertise. After reviewing his family's history of prostate and other cancers, the counselor got prior authorization from Burhans' health insurer for a test of 28 genes. It found he was positive for a pathogenic mutation in the BRCA 2 gene, which has shown the strongest association among all gene mutations with aggressive prostate cancer as well as breast, pancreatic and ovarian cancer. As a result, his insurer, Empire Blue Cross and Blue Shield, approved costly treatment for Burhans with olaparib, which researchers have found effective in treating patients with metastatic prostate cancer that no longer responds to hormone therapy. In addition, his family members sought BRCA gene testing. One close relative who received a positive BRCA 2 finding underwent prophylactic surgery. He and his immediate family members now undergo frequent screenings for breast, ovarian and pancreatic cancer as well as melanoma. Still, questions remain about the cost-effectiveness of testing for some populations, and how it affects the quality of life for patients and their families. Even advocates of more testing, like Giri, acknowledge that no standard clinical guidelines from oncology and urology groups currently exist for testing and that more research is needed on how to optimize its value. For instance, how does finding a mutation in men with a low-grade tumor affect subsequent decisions to treat or follow an active surveillance regimen? "Payers want to know if using that information really leads to changes in management of patients, and ideally want to know if that translates into better health outcomes," said Donna Messner, senior vice president of the Center for Medical Technology Policy, an independent not-for-profit that conducts comparative-effectiveness and patient-centered outcomes research. "If not, why pay for it?" Experts say only a small percentage of men carrying these potentially deadly mutations are receiving genetic testing, either the germ line test for inherited mutations or tumor-based sequencing typically done for advanced prostate cancer. Many oncologists still aren't aware of the value of testing men with diagnosed prostate cancer or a family history of related cancers or BRCA mutations. Most men in these situations don't know either, according to leaders of prostate cancer patient support groups. That's of mounting concern to cancer specialists, because a first-ever expert consensus conference on inherited prostate cancer risk held in Philadelphia last year supported testing for mutations in the BRCA 1, BRCA 2 and other genes to guide screening for and management of both early-stage and advanced prostate cancer. Testing for patients with advanced prostate tumors can be clinically useful because those who test positive for the BRCA 2 mutation increasingly are being treated with PARP-inhibitor drugs such as olaparib, which recently was approved by the Food and Drug Administration for treatment of BRCA-mutated breast and ovarian cancer. It also was granted "breakthrough therapy" status by the Food and Drug Administration for metastatic prostate cancer in men who carry a BRCA mutation and no longer are responding to hormone therapy. Such testing also is being suggested for men who either are at inherited risk for prostate cancer or who have been diagnosed with an earlier-stage form of the disease. Recent guidelines from the National Comprehensive Cancer Network, American Urological Association and American Association of Clinical Urologists recommend genetic counseling and testing for men with diagnosed prostate cancer or family histories of prostate or related cancers including breast, ovarian and pancreatic. "For undiagnosed men with family cancer histories, if they test positive for BRCA you'll screen them more aggressively," said Dr. Mark Edney, a urologist in Salisbury, Md., who serves as a physician adviser for Myriad Genetics, a larger provider of BRCA testing that has business deals in place with AstraZeneca, the maker of olaparib. Myriad has seen increased demand for BRCA testing among men since the original National Comprehensive Cancer Network guidelines came out a year ago, though the company still tests far more women than men, said Ron Rogers, a company spokesman. While Medicare and some private insurers cover genetic testing for prostate cancer in men meeting NCCN guidelines, at least three major health insurersâAetna, Anthem and Humanaâsay they do not cover it at all. There's no scientific evidence that genetic testing improves the detection, diagnosis or management of prostate cancer, Anthem's policy states. Blue Shield of California Uses Blue Cross and Blue Shield Association evidence review, covered when deemed medically necessary. Centene Did not respond to query. Kaiser Permanente Testing decision made in partnership between the patient and physician; genetic counselors work with patients to determine what testing is right for them. Molina Healthcare Use recommendations from National Comprehensive Cancer Network and coverage guidelines from state agencies . Tufts Health Plan Covered for men with family history of BRCA mutation, personal history of prostate cancer, or family history of prostate or related cancers. UnitedHealthcare Covered for men with high-risk prostate cancer and family history of prostate or related cancers; also covered for men with no personal cancer history but with family history of related cancers or BRCA mutations. Patients without insurance coverage for testing have to pay a median price of nearly $2,500 to receive a germ line test for BRCA 1 and BRCA 1 mutations, according to Amino, a company that compiles medical pricing information. Some lab companies, however, offer germ line testing for about $250. Somatic testing, generally done on patients with advanced prostate cancer, tends to be significantly more expensive. Aetna, Anthem, and Humana appear to be the outliers, however. Providers say coverage isn't a problem for most patients if they meet the NCCN criteria and can show that close relatives had a related cancer and/or were positive for BRCA mutations. Several hospital oncology centers are pushing to expand genetic counseling and testing for identification and treatment of prostate cancer. For patients whose insurers don't cover these services, counseling and testing may be offered free as part of a research study. The Sidney Kimmel Cancer Center in 2014 started what it calls the nation's first clinic for counseling and testing men for inherited prostate cancer. The Seattle Cancer Care Alliance opened a prostate cancer genetic clinic in 2016 in response to the NEJM study. Memorial Sloan Kettering Cancer Center also has an ongoing study of inherited risk for prostate cancer. But physician awareness about the role of gene mutations in prostate cancer remains spotty. That's a particular problem for men with advanced prostate cancer because once they become resistant to hormone treatment, their next best bet, olaparib, can cost $10,000 to $15,000 a month. Insurers generally won't consider covering it, however, without a finding of a BRCA 2 gene mutation. "I'm sure I wouldn't have been able to convince my insurer to pay the extraordinarily high cost of the drug if I hadn't tested positive for the pathogenic mutation," Burhans said. "Some of the patients I interact with in the support group are paying for the drug themselves, but some of them are investment bankers and can afford it." Len Sierra, a retired pharmacologist who lives in Danbury, Conn., had an experience similar to Burhans'. In 2014, he was diagnosed with aggressive prostate cancer. He said his medical oncologist never mentioned anything about genetic testing. But his son, a cancer researcher, told him that Memorial Sloan Kettering Cancer Center had established a genetic database for prostate cancer patients and that he could receive free testing there. Tissue testing of a prostate biopsy sample showed Sierra had a BRCA 2 somatic mutation caused by the cancer. That meant he was an appropriate candidate for olaparib if his cancer metastasized and no longer responded to hormone therapy. In addition, he underwent germ line genetic testing, which showed he did not have inherited mutations. Sierra says he tells the prostate cancer patients he works with through the Answer Cancer Foundation's online support groups to seek out a specialized genitourinary oncologist for their care, because too many general medical oncologists are not knowledgeable or proactive about genetic testing. "Those guys have no clue advanced prostate cancer patients should be tested," he said. "Even when oncologists know about it, for God knows what reason, they don't necessarily bring it up."